CK Hutchison, part owed by Asia's richest man Li Ka-Shing, has had its U.K. mobile ambitions thwarted. European officials have blocked a bid by Hong Kong's Hutchison to buy British mobile operator O2. 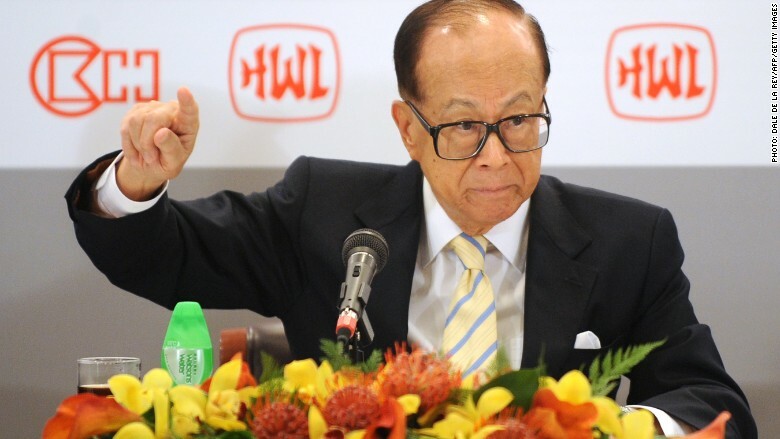 CK Hutchison (CKHUY) -- part owed by Asia's richest man Li Ka-Shing -- was planning to merge O2 with Three, its own UK mobile operator, to create the biggest player in the market. It offered £10.25 billion ($14.8 billion) to buy O2 from Spain's Telefonica (TEF) in March last year. But the European Commission said the deal would have reduced competition and led to higher prices for consumers. It would have cut the number of players in the U.K. from four to just three. "We had strong concerns that consumers would have had less choice finding a mobile package that suits their needs and paid more than without the deal," said Margrethe Vestager, the EU's top antitrust official. O2 has been hamstrung in recent years by high debt levels and increased competition in Europe's cutthroat mobile industry. A wave of consolidation has hit the European market, sparking worries over reduced competition. The European Commission rejected the deal despite Hutchison promising it would not raise prices for five years following the merger, and that it would work with other companies to ensure competition in the market. Vestager said the remedies offered by Hutchison did not go far enough. Hutchison said it was "deeply disappointed" by the decision to stop the merger, adding it would consider a legal challenge.